Mrs. Scafidi has been part of our practice team since August 2018. 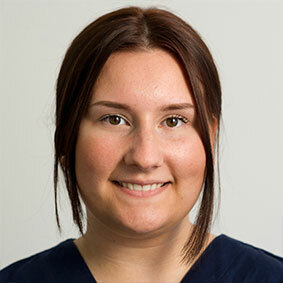 As a trainee for the ZFA (Dental Assistant), she actively supports us in all areas of everyday practice – but above all in treatment assistance, reception and sterile processing. Mrs. Scafidi made the decision to complete an apprenticeship as a ZFA with careful consideration: After two internships in dental practices, she finally knew that this was the right profession for her. So the decision was made in favour of dentistry and against veterinary medicine, because training as a veterinary nurse was also an option. Mrs. Scafidi nevertheless remained faithful to the four-legged friends: In her spare time she is there with great enthusiasm for her dog and her rabbit. Celina Scafidi not only enriches our team with her calm and cheerful manner, but also her stay in our practice.